These days, Wes has been a lot more open to intense physical exercise, and I have been a lot more open to indulging in all-American barbecue. 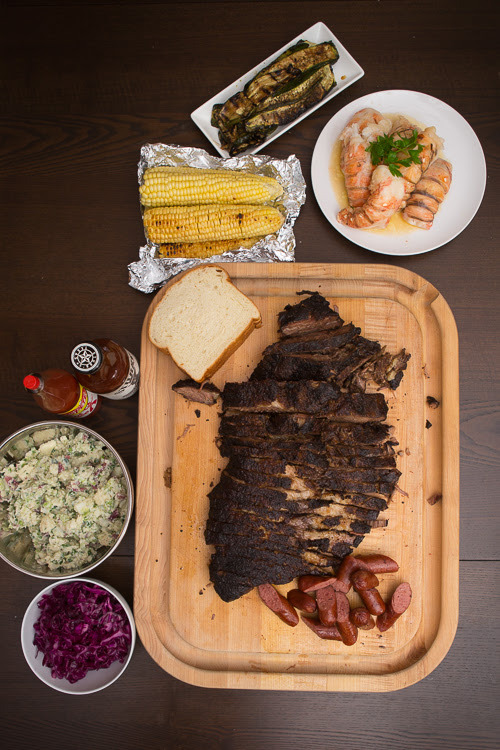 Not that he never liked to go on hikes and bike rides, and not that I never enjoyed some good, drippy ribs - but when we're talking about a 30-mile roundtrip bike ride from Pasadena to Azusa (in pelting rain) and an 12-pound slab of brisket...that's a new level of tolerance for both of us. 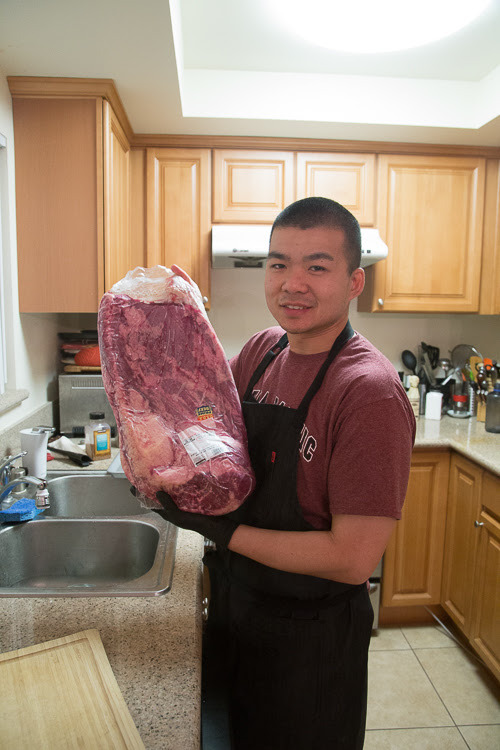 Wes saw this gargantuan prime brisket at Costco for three bucks a pound and jumped on it. I was dumbfounded - I would never have even bothered to read the label on a piece of meat that big. 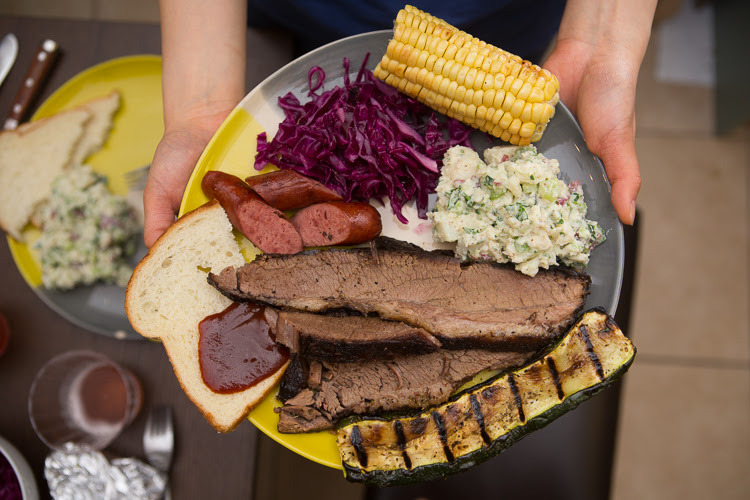 We were supposed to go on a long bike ride that weekend but it was going to rain hard, so we thought that maybe we'd do part of the route and come back home, and I guess, make this brisket while kicking back on the couch. Neither of us thought that we'd end up doing the entire bike circuit anyway and then last-minute hosting four adults and two children age 3 and under. What a day. 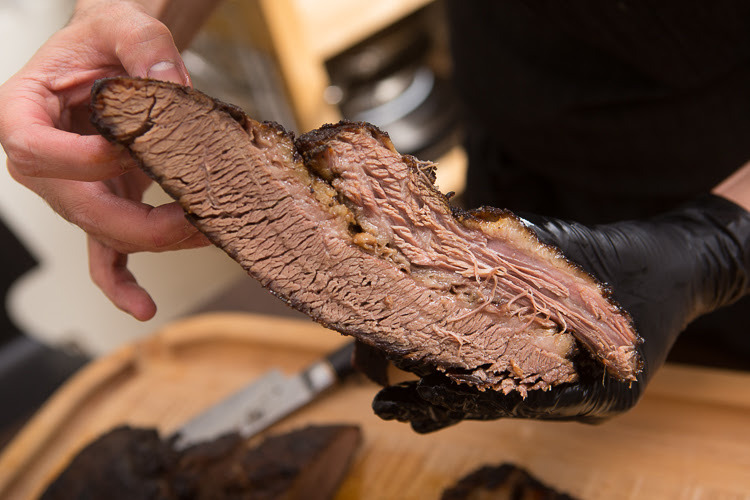 Wes got up early to start smoking some hickory wood chips and then plopped the brisket into the smoker just before we got our helmets and rain jackets on. Leaving meat cooking unattended is totally okay, yeah? The smoker's electric! Arcadia - most picturesque part of the ride. Stopped to check out these pretty cherry blossoms, just randomly by the roadside. Azusa...not much to see here, but feeling very accomplished. We actually finished to the end, and turned back when it started to sprinkle. We had the option to get on a Metro, but we didn't. It rained so hard on the way home! We stopped for shelter at Goldstein's, this bagel place that we'd always been curious about in Arcadia. I ate pretty slowly, as usual, but the storm was still coming down hard even after I had polished off every last alfalfa sprout and my little cup of extra hummus. 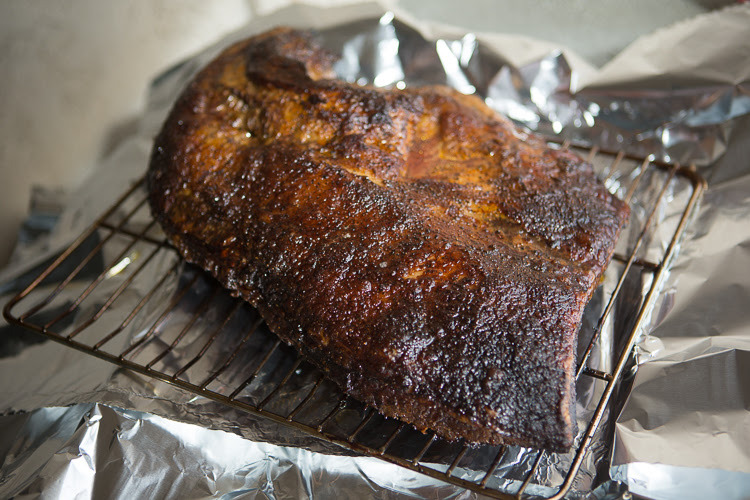 By the time we were home, the brisket had been slowly smoking away, unwrapped, for a good four to five hours. It smelled so darn good already. Wes wasted no time in wrapping it up in foil to continue the cooking process. 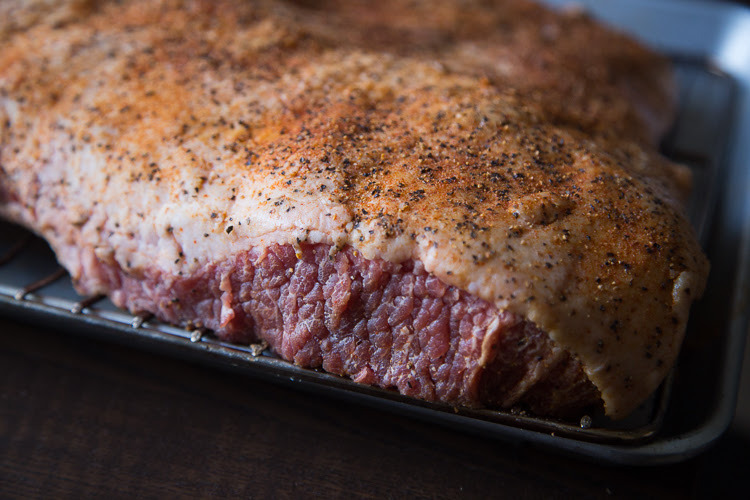 Now wrapped up in all of its juices, the brisket sat in the smoker for another four hours before our guests arrived. Not sure why we took on so much in one day, but in the end, we never regret a good workout, good home-cooked food, and even better company. We've had a slew of super eventful weekends lately (never enough time to blog all of it), but this one was particularly memorable. 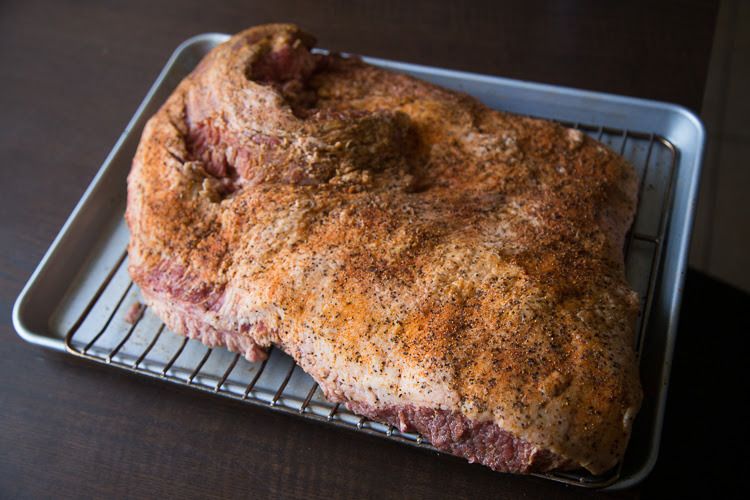 Wes trimmed off a bunch of fat the night before and rubbed the brisket with a mix of paprika, salt, pepper, and garlic powder. Smoking it unwrapped rendered a nice blackened crust after the first four/five hours. 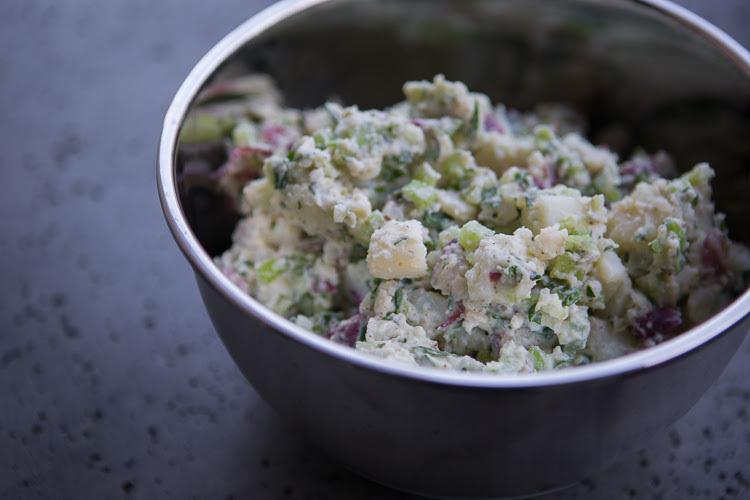 I also made potato salad with labne in place of mayonnaise, and nobody could even tell! 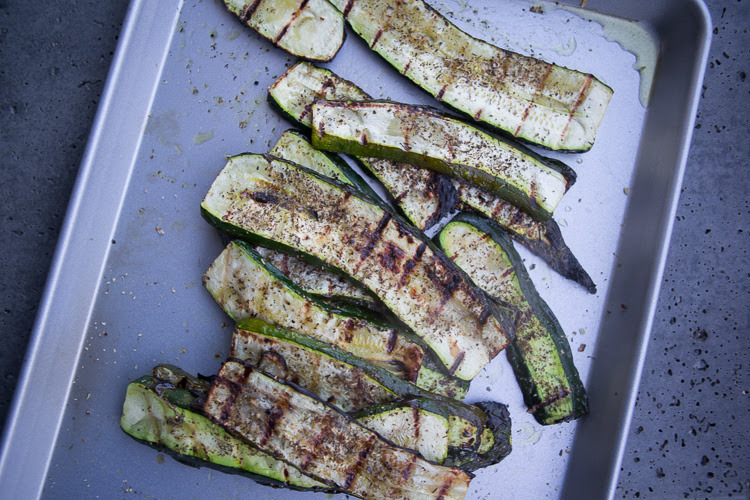 Grilled squash for good measure. 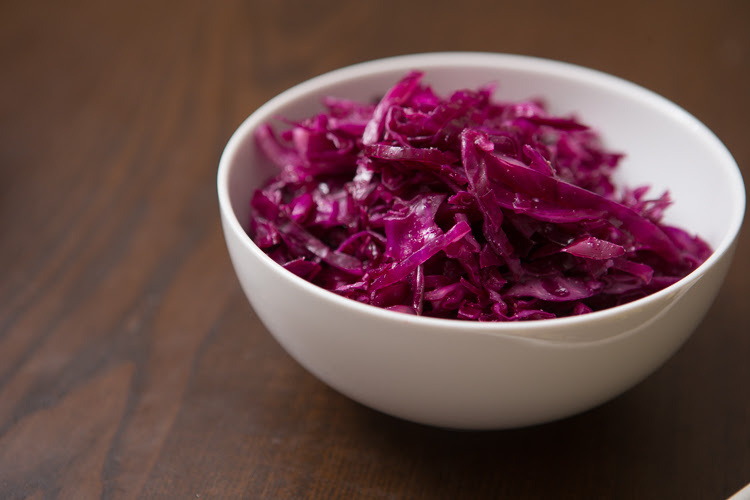 Pickled red cabbage with a little red wine vinegar and mustard seed. 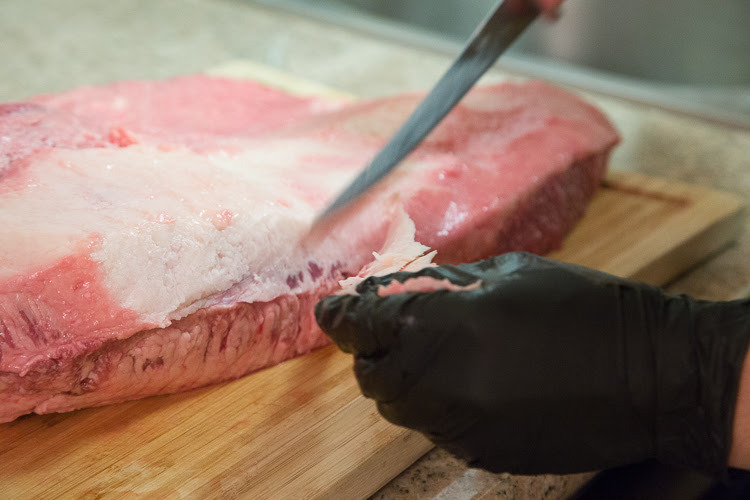 A quick 30 seconds in the vacuum sealer was all that was needed, especially since we were sort of short on time. Wes's brother randomly decided to bring some really plump lobster tails... as if we didn't already have enough food to feed the entire neighborhood. 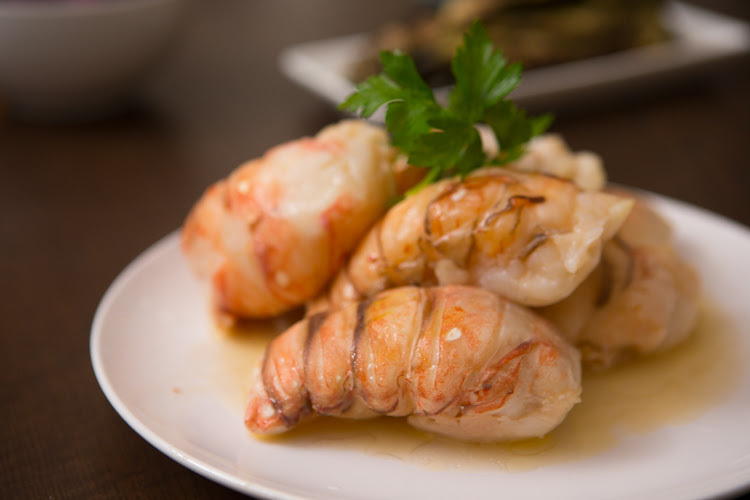 He cooked these sous vide and they were bomb! 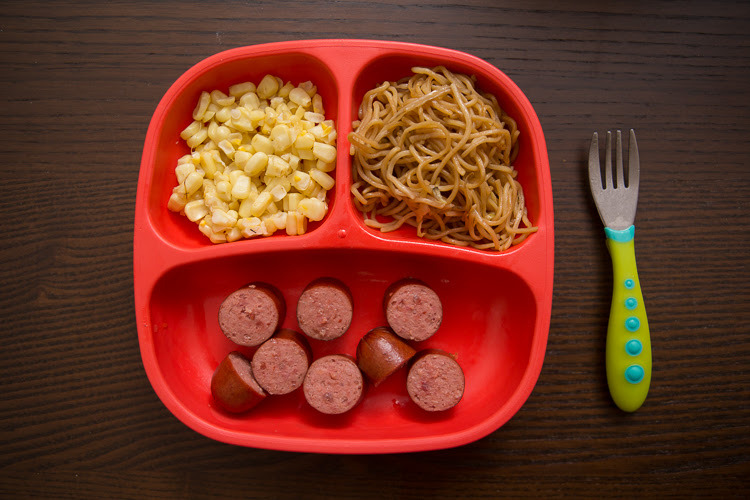 Madison did not partake in the brisket or the lobster, so she had some sausage, corn, and noodles. 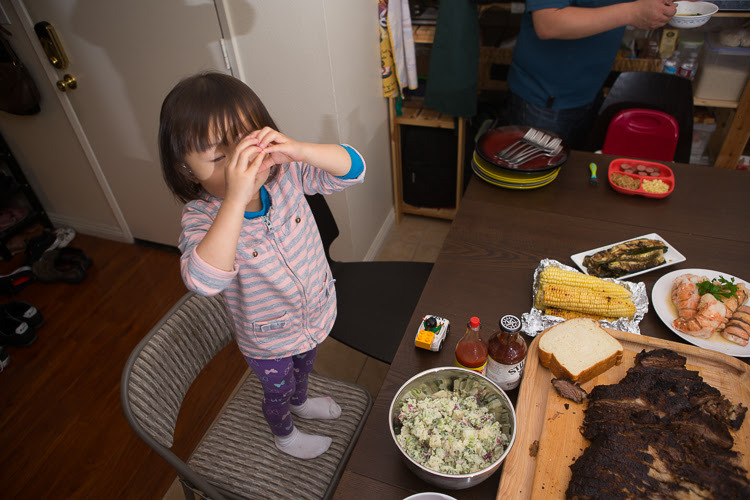 We made sure that the sausage was nitrate-free, and that her food groups were well-segregated. Little 2-month-old Evan enjoyed his breast milk for the night. Well, here's Auntie Choo-Choo's picture from on the chair. She tried her best to get it all in there. Definitely needed to be on a chair. 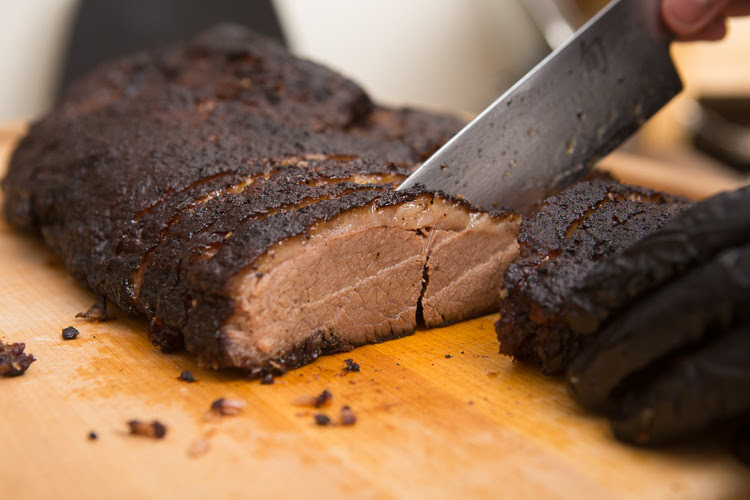 Yay, so moist and juicy. Oh yeah, and we made sure to have some white bread to go with everything. It had been years since I ate actual white bread. Wes thought that this was sadly entertaining: I just could not bring myself to be okay with Bimbo or Wonderbread...even though I kept telling myself that those brands are completely legitimate, and the truest (most processed) representation of American food. We stood there in the bread aisle at Vons for ever, while I cautiously sniffed and poked those lanky, unnaturally plushy loaves... it's all mental, it's all mental, it's all mental. Wes knows me well - he pulled those loaves out of my wringing hands and put them both back on the shelf, escorting my torn superego to the Vons bakery. Decisively, he grabbed some freshly baked white bread out of a basket there instead. At least it expired within the week rather than, um, whatever it said on the Bimbo packet. Maybe next time, when I'm braver, we will be less un-American.